Dry chicken thighs on a paper towel, season with salt and pepper. Heat a large ovenproof sauté pan, add the vegetable oil and warm. Working in batches as needed, carefully cook the chicken on both sides. Place all the pieces in the pan, pour enough chicken broth in the pan to cover the chicken halfway. Cover with foil and bake in a 325°F oven until tender, about an hour. Remove and cool; tear chicken into small-to-medium pieces. Sauté diced apples in a pan coated lightly with a spray of oil until edges begin to brown. Drizzle with honey; stir to evenly coat. Bake in oven until tender, about 15 minutes. Set aside to cool. Slice the figs into quarters. Lay puff pastry sheet on work surface; cut into 4 5×5 squares. Preheat oven to 350°F. Place puff pastry on work surface, divide cooked chicken evenly over the pastry. Top with 4 slices of fig, an equal portion of roasted apple and equal portion of Gorgonzola cheese. Pull up corners of pastry and gather in the center. Brush lightly with egg wash. Bake in the oven for about 20 minutes until golden brown. In a small saucepan add port wine and reduce slightly, add pomegranate molasses, brown sauce, and fresh thyme. Bring to a simmer to combine flavors. 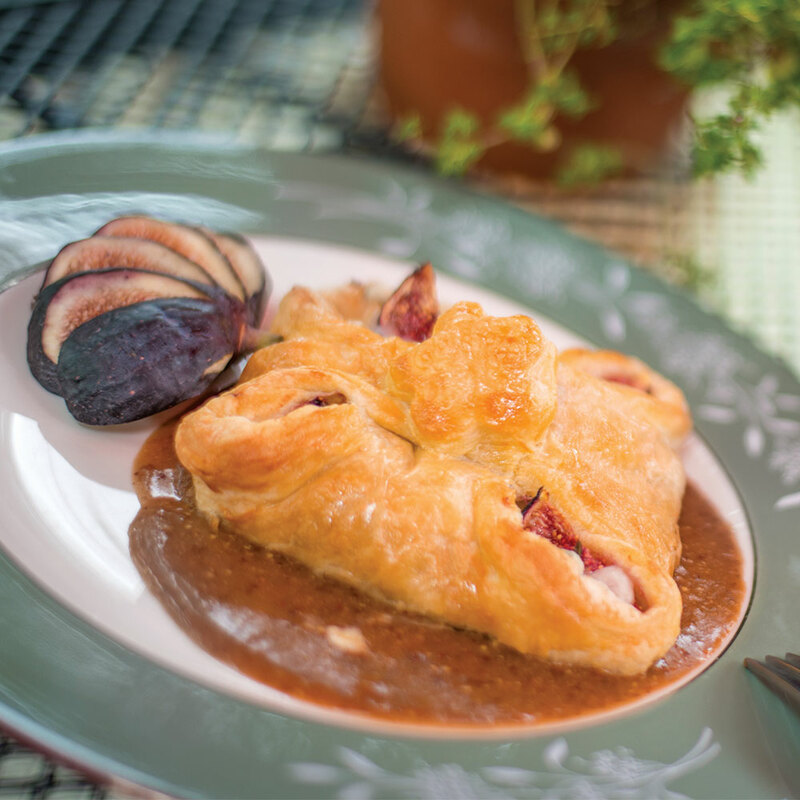 Divide sauce evenly among the four plates, top with puff pastry. Serve and enjoy.